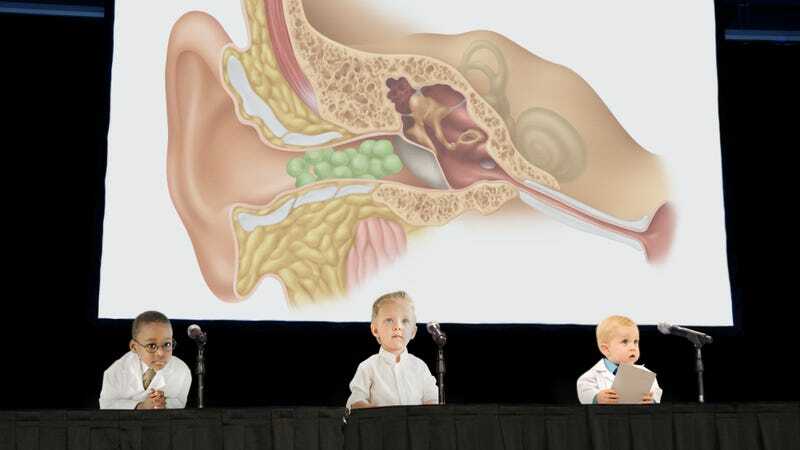 NEW YORK—After years of speculation and countless failed experiments, leading toddler scientists announced Friday that they had finally determined the exact number of peas that fit into the ear canal. “Until today, it has been widely understood that only four peas could be stuffed into one’s ear, but our research has conclusively shown that was a conservative estimate,” said Dr. Audry Plodtz, 2, adding that several toddler test subjects demonstrated the ear capacity to insert up to six peas and that the number increased considerably if the peas were mushed beforehand. “On the other hand, our work upheld the conventional wisdom in another respect, as we were able to confirm that peas jammed in the ear canal taste just as good, if not better, once retrieved.” Dr. Plodtz cautioned, however, that the study only addressed one specific scenario and did not necessarily apply to how many corn kernels fit up a nostril.